Hybridization — problems, or solutions? 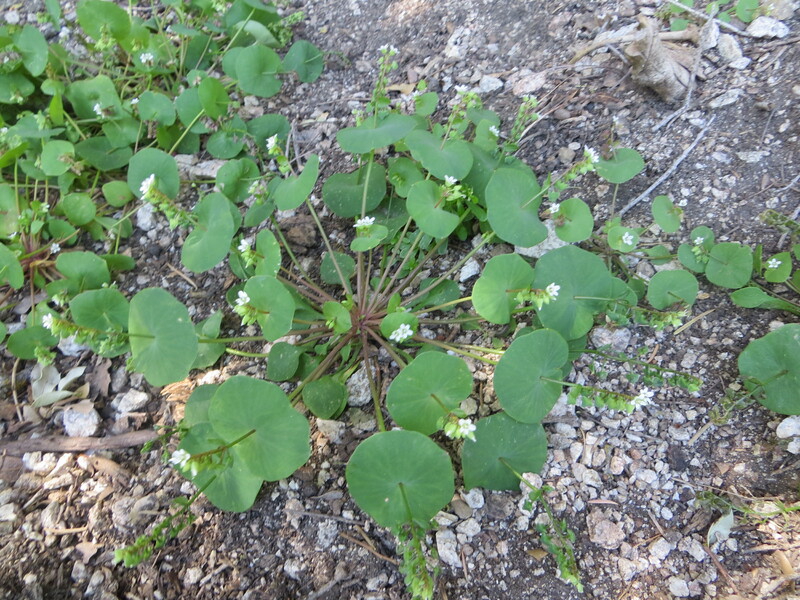 Claytonia parviflora subsp. viridis — Tejon Ranch. Note the linear basal and cauline leaves of this mildly succulent annual. Were you to collect, you could rest easy with ID of this plant. 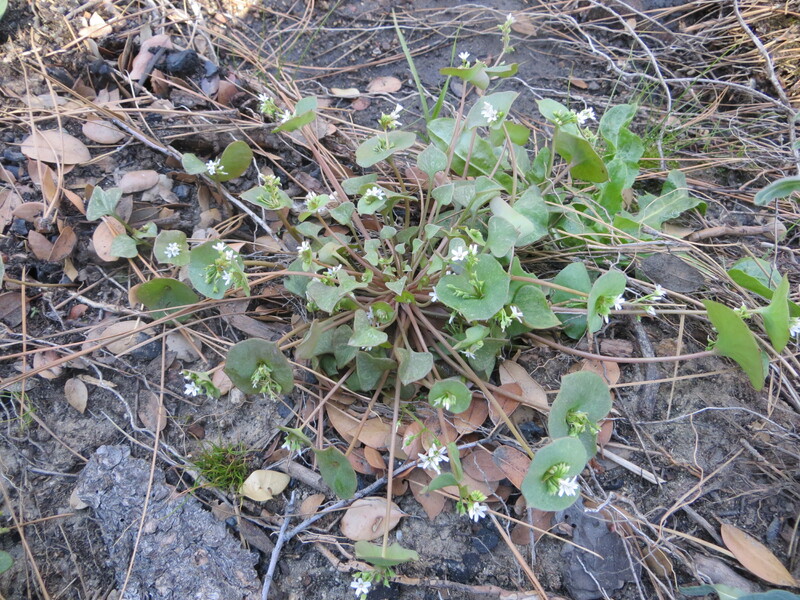 Claytonia parviflora subsp. viridis X C. rubra ?!? !– Tejon Ranch. 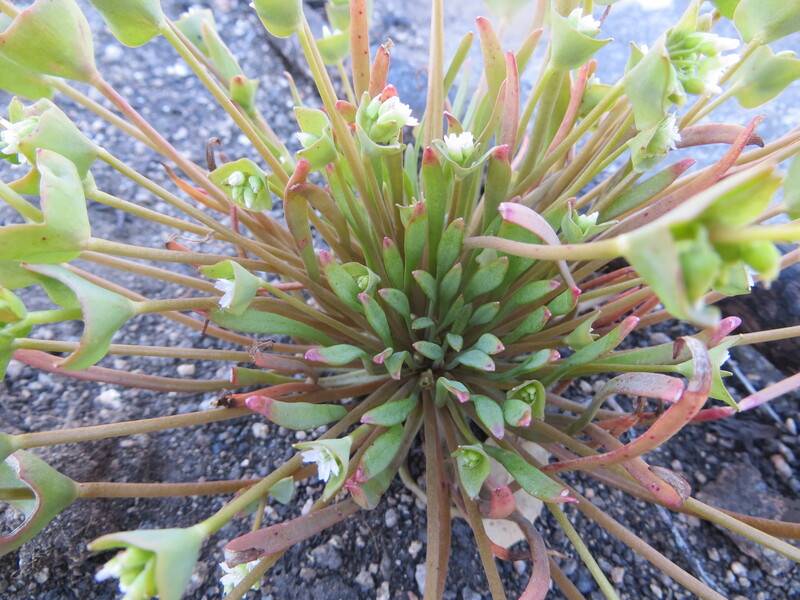 Note the non-linear basal and cauline leaves of this moderately succulent annual, and the floral morphology of C. rubra. Yet, this plant retains the fully separate leaf pair of C. parviflora subsp. viridis. 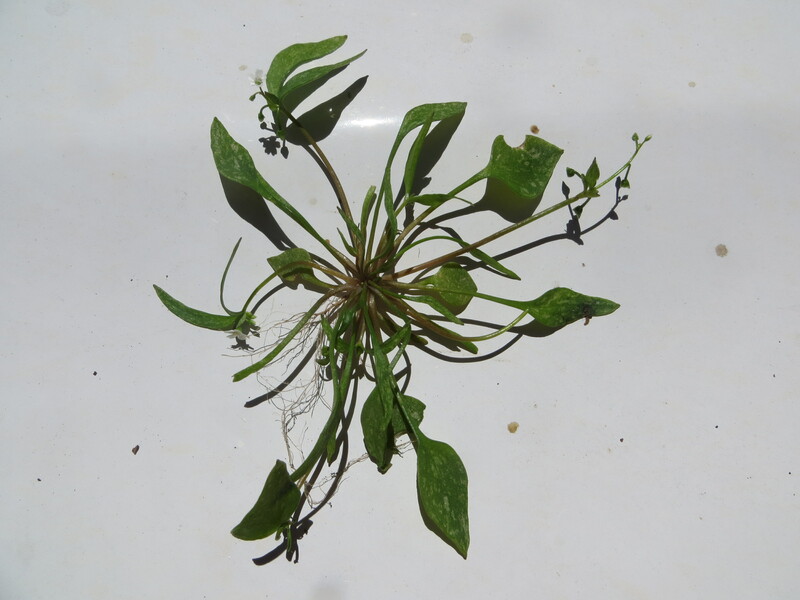 Claytonia exigua (left) and C. exigua X C. perfoliata (right) ?!?! — Tejon Ranch. 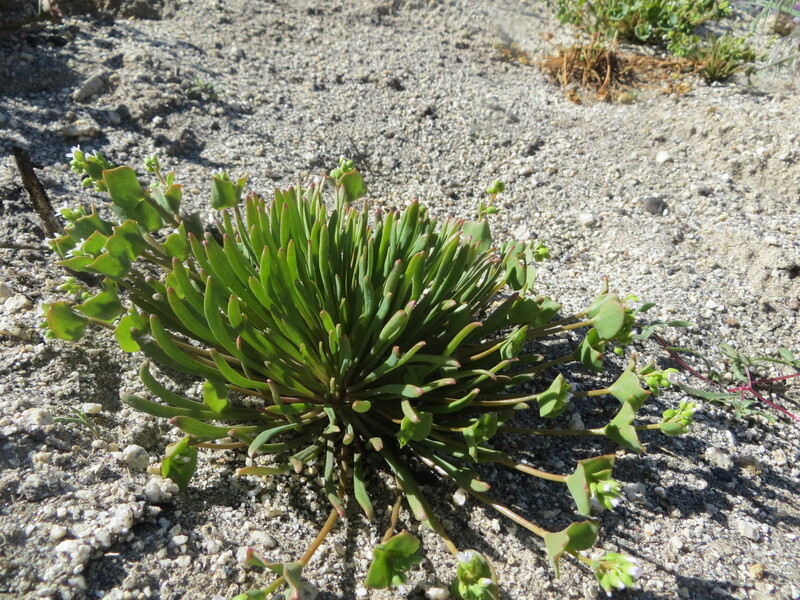 Note the glaucus basal leaves of the plant on the right, which should otherwise look like the plant in the first picture of this post. Yikes! More fun with sympatry on Tejon Ranch!!! 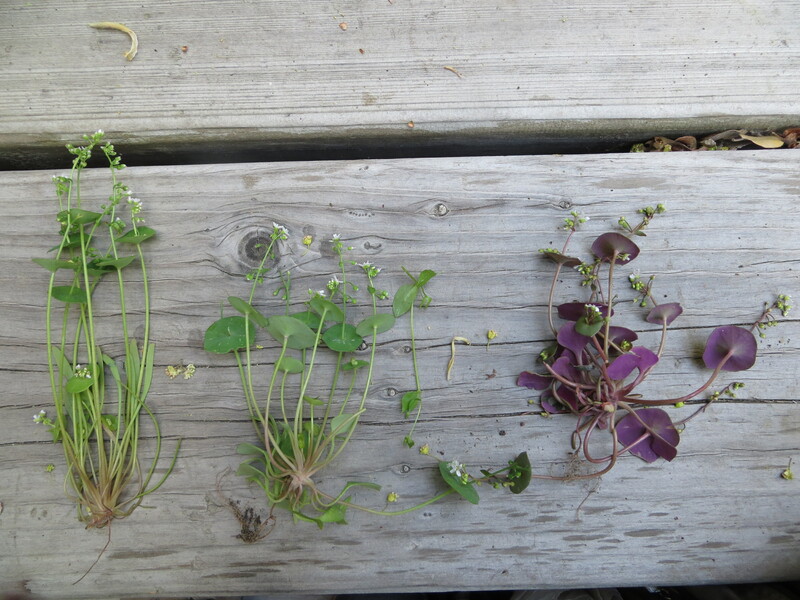 Left to right, Claytonia exigua, a diminutive C. perfoliata, and something that approaches C. rubra in morphology — section Limnia is tough! Could this possibly even be the same as any taxon we’ve seen elsewhere in this blog post? I’m really not sure, but I would lean toward calling it C. perfoliata-like. The C. perfoliata complex, including also C. rubra and C. parviflora, is probably the most difficult group in section Limnia. 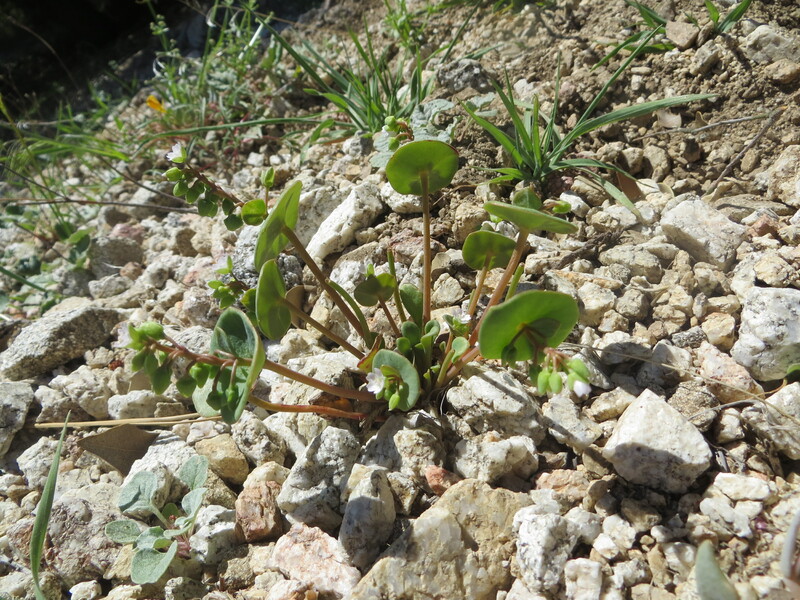 This is also Claytonia perfoliata! Its first leaves are narrow like these. Under drought conditions it can ‘bypass’ switching to the more mature spatulate leaf condition by going directly into flowering and therefore only producing the perfoliate cauline leaves. 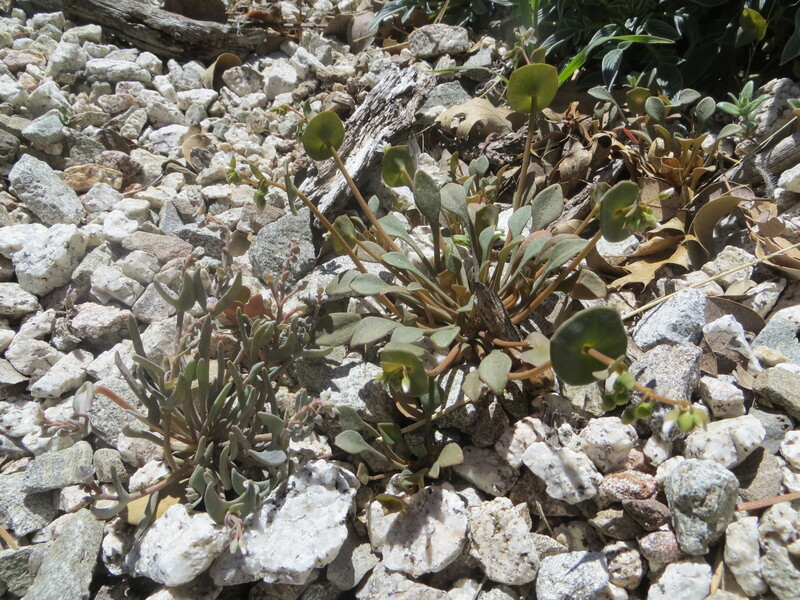 Contrast (or compare, in case of my suggested hybrids) the above pictures with this one of Claytonia rubra — this appears to be a good example of this species which at one point was treated as C. perfoliata but has been found to be a unique lineage and is treated as such. 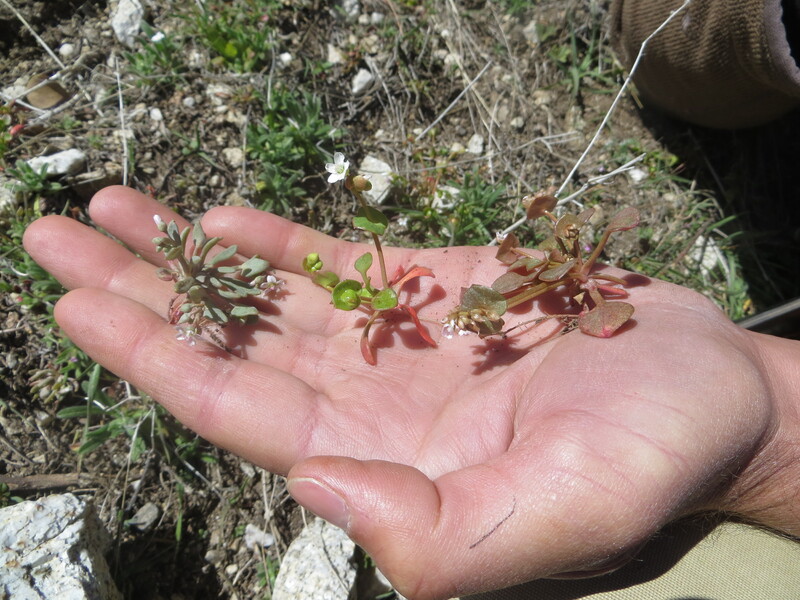 Now, compare the picture immediately above (of Claytonia rubra subsp. rubra) with this one — same or different?! Same! Well, sorta… This is ALSO C. rubra, presumably subsp. depressa, which apparently also occurs on the Tejon Ranch — how exciting! Okay, so interestingly enough, I took all of these photos (and many, many, many more) in only one day on Tejon Ranch with Nick Jensen, a colleague at Rancho Santa Ana Botanic Garden doing a floristic study of the area. His website can be found here. This is a fascinating area because it serves (or, served) as a biogeographic traffic signal for the Sierra Nevada, the Transverse Ranges AND the San Joaquin Valley and the Mojave Desert. 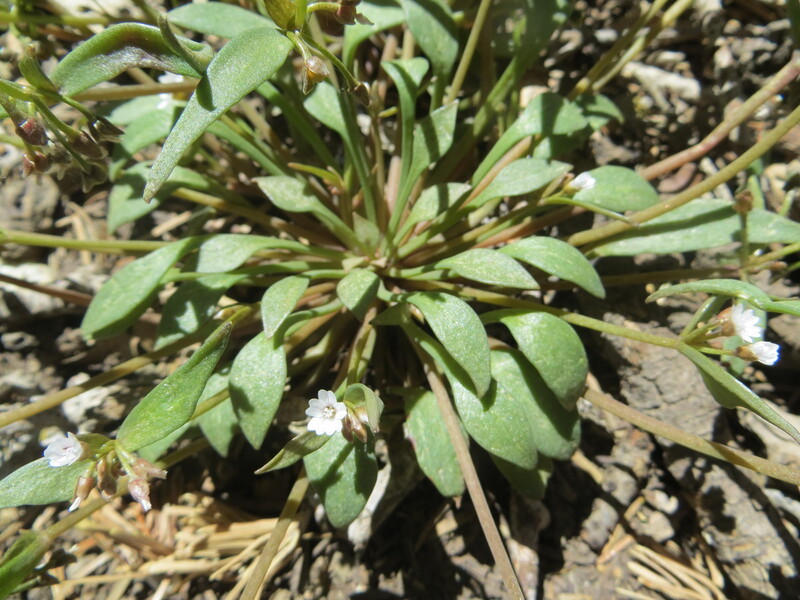 I suspect the evidence for hybridization exhibited by the numerous sympatric Claytonia here is mirrored in other plant groups on the Tejon Ranch where multiple taxa co-occur. But that isn’t all, of course — the evidence of hybridization reappears in every mountain range I have explored in southern California! 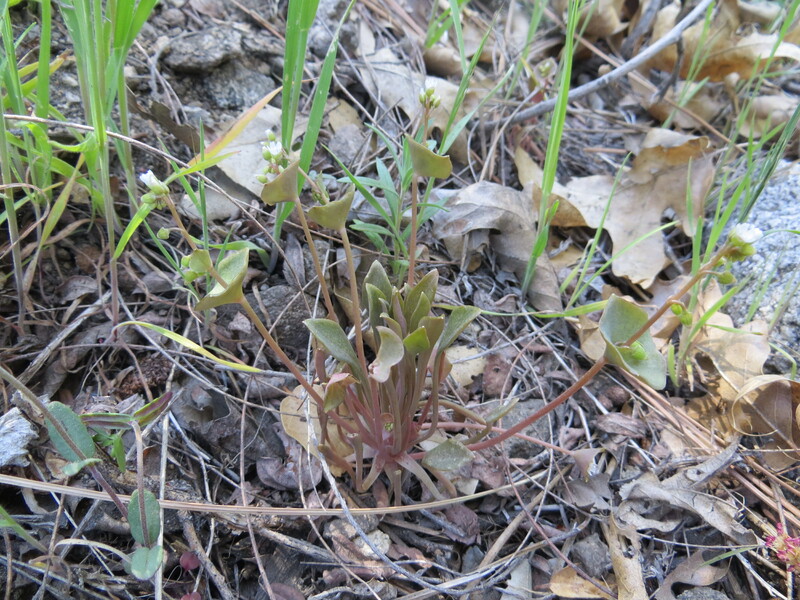 It seems to be a battle among divergent lineages to survive and compete for overlapping and limited niche space near the southern part of the geographic distribution of these plants, but maybe a little cooperation wouldn’t hurt for the ‘greater good’ of Claytonia if it increases genetic diversity… In the San Bernardino Mountains, you can find members of the C. perfoliata species complex in sympatry. The evidence for hybridization in this area mirrors what I observed at Tejon Ranch. 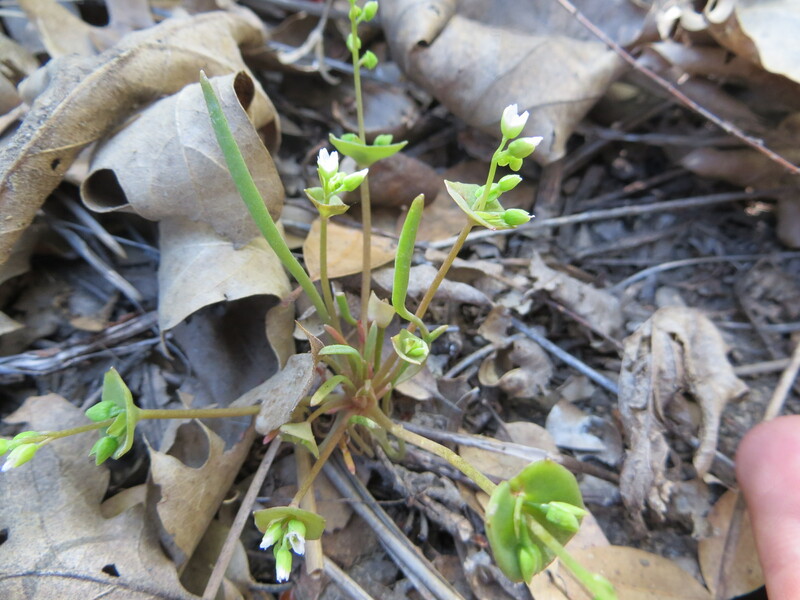 From left to right, Claytonia parviflora, C. perfoliata and C. rubra, all members of the C. perfoliata species complex occurring together in Mill Creek Canyon, San Bernardino Mountains. 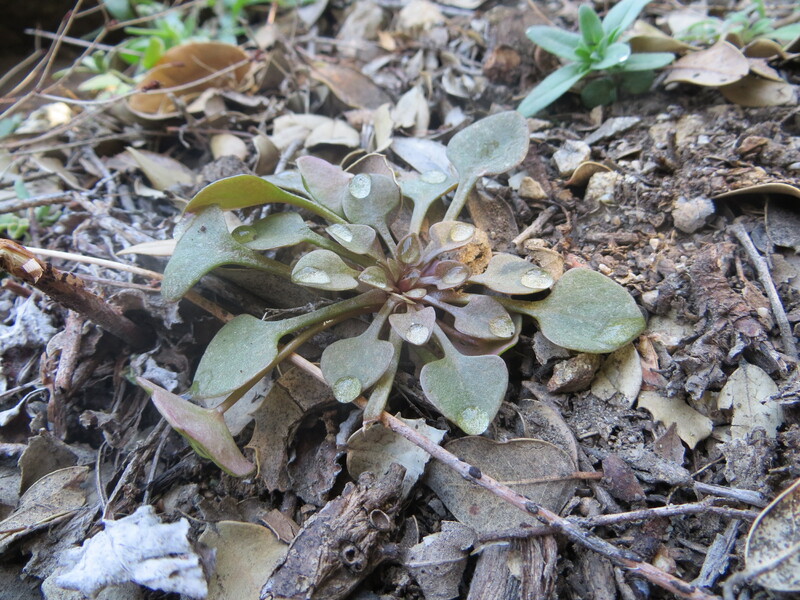 A good example of Claytonia parviflora; note the erect, linear basal leaves that are almost terete in shape, and the cleft in the disc-like cauline leaf-pair resulting from incomplete fusion of two leaves. Compared with the picture immediately above, this one looks like a fusion of C. parviflora and presumably one (or both?) of the other two annual species in the area. I tend to think C. perfoliata may have played a role in the formation of this hybrid, but we can only be sure by DNA sequencing or by extensive cytological screening. Note the erect basal leaves that are no longer linear in shape but instead have rather distinct blades — this is NOT C. parviflora in the strictest sense of the name. 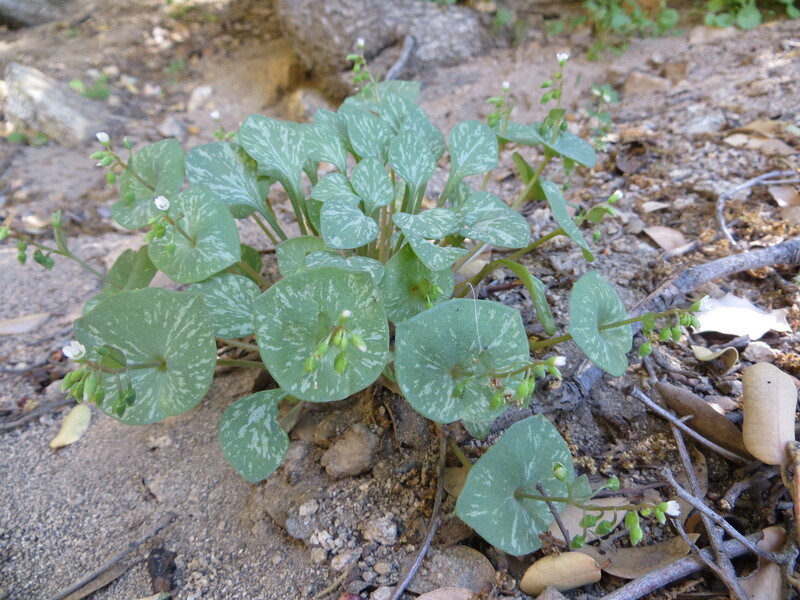 In the San Jacinto Mountains, you can find more of the same — members of the C. perfoliata species complex in sympatry and evidence for hybridization that may make you want to tear your hair out if you are working to identify plant specimens collected here. For instance, the pictures below from the San Jacinto Mountains are more or less taken from within ~1 contiguous square mile in Garner Valley. An excellent example of C. parviflora subsp. 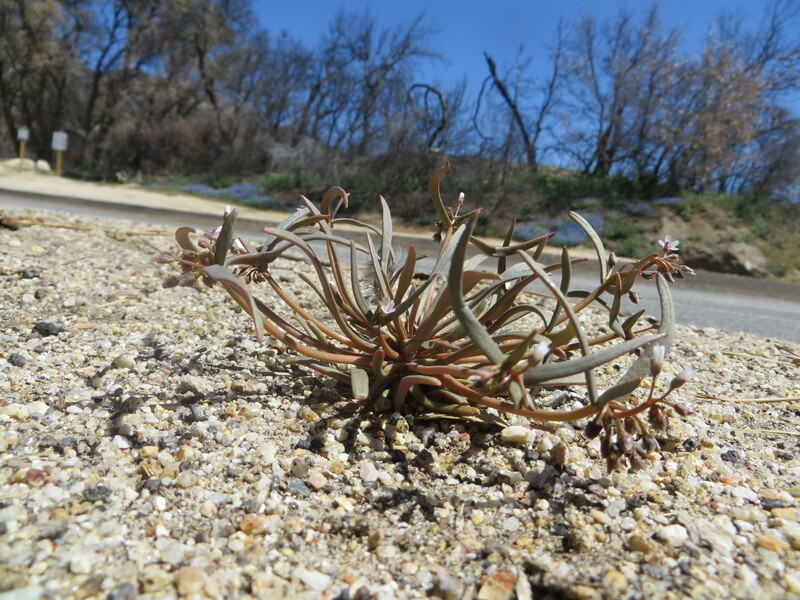 viridis is strutting its stuff roadside in the San Jacinto Mountains. Here, you have more action in the ring coming from the C. parviflora corner than from elsewhere in the C. perfoliata complex — I’m not sure the reason but think it is related to the locality I visited, a recently burned area in Garner Valley with little overstory cover. 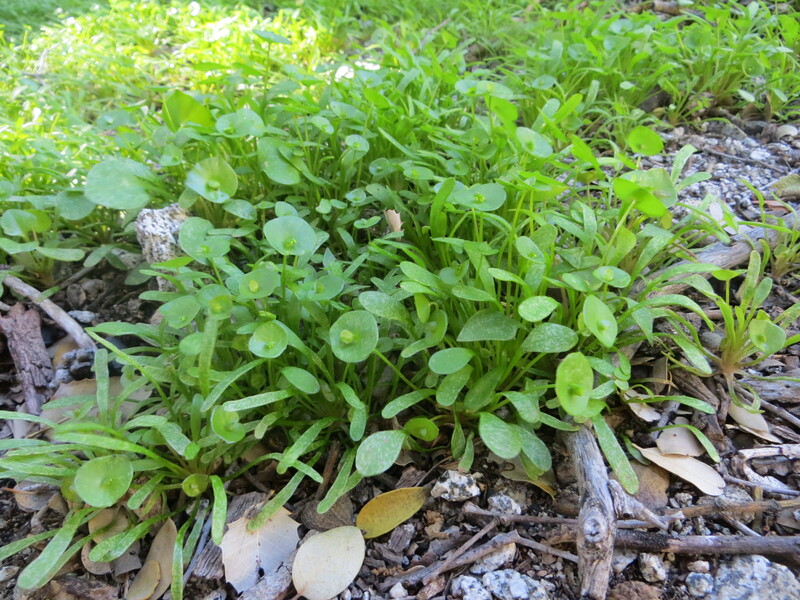 Compare the picture immediately above (of C. parviflora subsp. viridis) with this one of C. parviflora subsp. parviflora — similarly erect basal leaves that approach a terete-linear shape, but a contrastingly perfoliate cauline leaf-pair that is almost completely fused (as opposed to the free cauline leaves of C. parviflora subsp. viridis photographed above). The two appear to have different coloration under the same conditions here as well in both the flowers and foliage. — Garner Valley, San Jacinto Mountains. Now, compare the picture immediately above (of C. parviflora subsp. parviflora) with this one of some sort of C. parviflora hybrid — similarly erect basal leaves but these appear to be forming distinct blade and petiolar regions unlike the other two photos above from the same general location… tempting to call them the same, but I imagine this fishiness has both rhyme and reason to it. — Garner Valley, San Jacinto Mountains. This plant is OBVIOUSLY different from the rest, but what do you call it?! 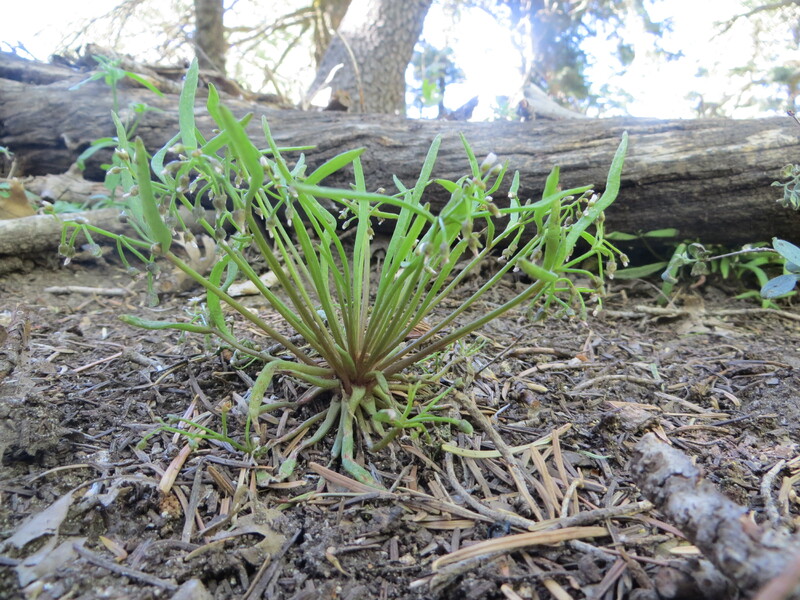 Under some Jeffrey pines that survived the fire, these plants approach the morphology of C. perfoliata subsp. mexicana but the smaller leaves in the center of the rosette are suggestive of certain races of C. rubra. — Garner Valley, San Jacinto Mountains.